Fishing from a paddleboard is relatively new here in Florida and in many other states. If you haven’t heard of it you may think it sounds a bit crazy, but paddle fishing has been around for a long time from canoes and kayaks. Fishing from a paddleboard is just the next step in this evolution. 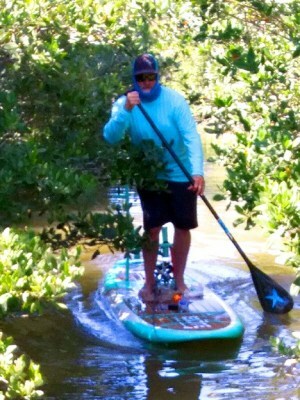 The added benefit to paddleboards over kayaks, is that you are sight fishing from a higher stance than in kayaks. Another benefit to paddle fishing is the serene feeling you enjoy as you stalk your unsuspecting prey with no one else around. The State of Florida has designated areas around the coastline as “No Motor Zone,” meaning that anglers can only fish in an area with a vessel that is paddled or pushed with a pole. Many more of these types of areas are going to be designated because of the improvement of the fisheries with the absence of busy boating and over fishing. The good news is that those anglers who can get their kayaks or paddleboards to these areas will experience a day of fishing like no other. The obstacle is that these areas are typically a very long distance to paddle. Manta Racks offers the perfect conveyance system to get your boards to these locations. Once you are in these areas, you are away from boat traffic. The fish are living in their natural habitat, hunting and feeding without being bothered. With a Stand-Up Paddleboard and the right accessories, any angler can hunt these predators in these amazing and peaceful areas. 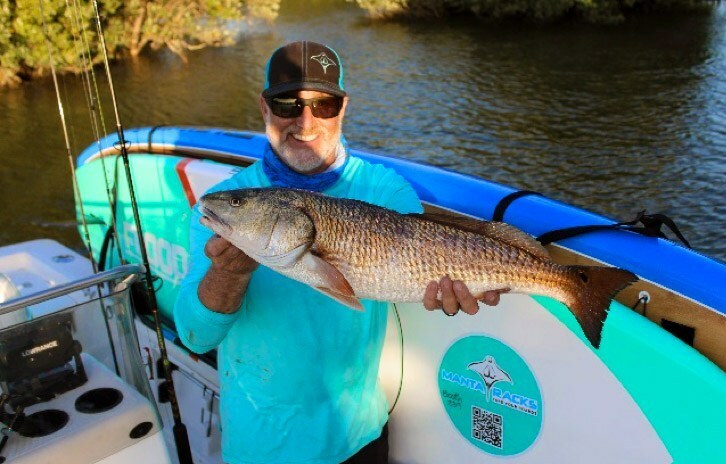 In this 4-part series of paddleboard fishing blogs, we will provide a look at these new areas where fish aren’t pressured by boats or human traffic, the accessories to consider bringing with you, the adventure, and a recipe for your catch. Manta Racks – Convenient & Versatile Paddleboard Storage. A customer of ours spent 2 weeks in the Florida Keys with his family this summer. He has a 24’ center console and fished off shore just about every day; but there were days that the seas were too big to have fun, especially for his kids. So, they packed up the paddleboards on their Manta Racks and headed for the flats. He told us that having the ability to take his paddleboards provided him the opportunity to fish, even when the seas were rough. Even though he did not have a flats boat, he could take his center console as far as he could go, anchor, and take the paddleboards to fish in areas he could not before. It makes us happy to hear from our customers telling of their boating expeditions using their Manta Racks. Our rack systems open up a whole other dimension in boating. Thank you, Joe, for sharing your adventure in the Keys. Mothershipping is catching on and becoming more popular every year. There are several thousand acres of “No Motor” zones, which are bursting with fish that aren’t pressured by humans. Many of these zones are too far to paddle to, whether on paddleboards or kayaks. Using your boat as a mothership to transport your boards or kayaks will open up these amazing opportunities to you. Follow these two links to a couple of professional fisherman who describe and show how easy it is to mothership.